Collectors buying gold from the United States Mint turn first and foremost to the Gold American Eagle. The official gold bullion coin of the US is available as a bullion coin for investors, but also in the popular proof version for collectors. Right now, 2018-W 1 oz Proof Gold American Eagle Coins are available to purchase online at Silver.com. Ships to you housed in a new presentation case from the United States Mint! 32nd year of issue for Proof Gold American Eagle coins! Obverse includes the Liberty design created by Augustus Saint-Gaudens. Reverse features the bald eagle design developed by Miley Busiek. 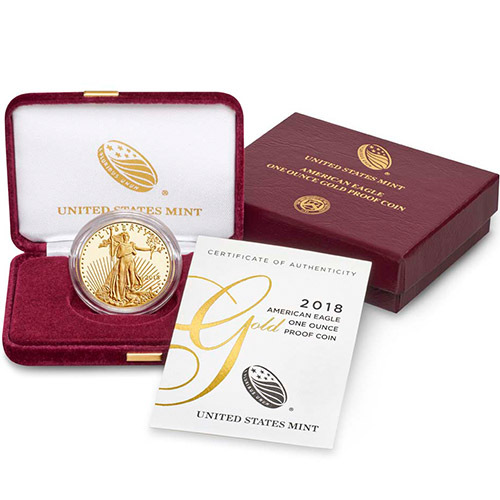 For 2018, the United States Mint proudly unveils a new presentation case for all of its Proof Gold American Eagle Coins. With your purchase of a 2018-W 1 oz Proof Gold Eagle today, you receive your individual coin inside of a new velvet presentation case that is satin-lined and burgundy in color. The case is shipped in a burgundy outer box and includes a Certificate of Authenticity. Also new in 2018, the US Mint has issued extremely low mintage caps for the Proof Gold American Eagle. The US Mint has typically used mintage caps in this series dating to 1993, but amid the unprecedented demand for gold in the 21st century those mintage caps have generally been much higher than 2018’s numbers. For 2018 , just 25,000 1 oz Proof Gold Eagles will be struck. 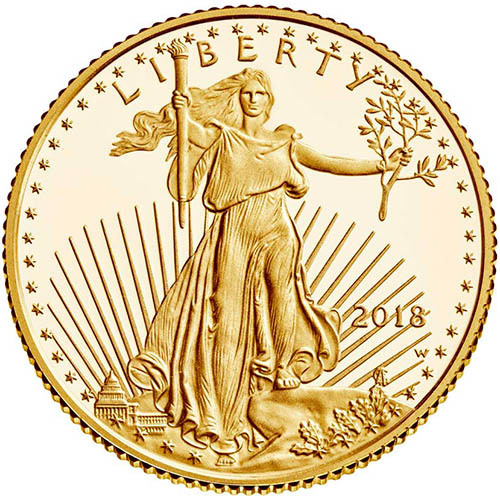 The obverse of all 2018 1 oz Proof Gold American Eagle Coins feature the full-length figure of Liberty as she strides forth from Washington DC. With the US Capitol Building visible at her feet, she guides the nation into an unknown future with a torch held high in her right hand to shine a light and an olive branch in her left for peace. 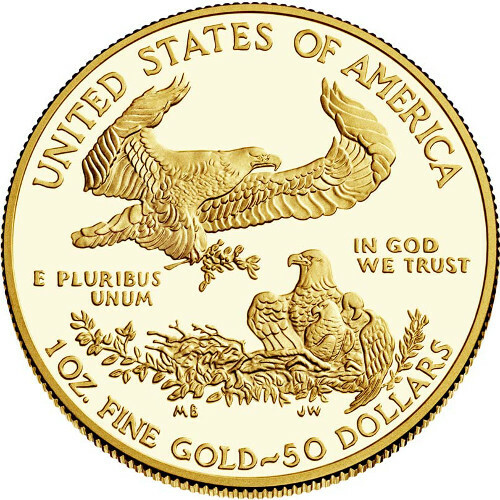 On the reverse of the Proof Gold American Eagle Coins you’ll find the family of American bald eagles. Created by Miley Busiek in 1986 exclusively for this collection, the design includes a male eagle flying over the nest with its wings outstretched to cover the whole nest. Below, a female eagle stands watch over the nest and its hatchlings. Found on all Proof Gold American Eagle coins is the “W” mint mark of the West Point Mint. If you have any questions about the Proof Gold Eagle, please don’t hesitate to ask. Silver.com customer service is available to you at 888-989-7223, online using our live chat, and via our email address.